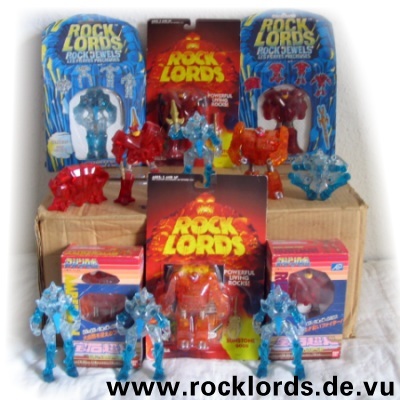 The Jewel Lords are part of the third Series of Rock Lords. They are clear crystals, and are all part of the good Rock Lords. They help Boulder and his team fight the evil Magmar and his gang of evil rock warriors. It's through the Jewel Lords Solitaire that travels to Gobotron along with Nuggit that the GoBot-Guardians first heard of the Rock Lords. 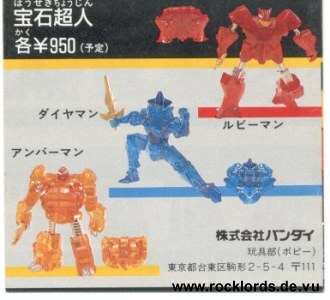 In Japan, the Jewel Lords were sold under the name "houseki choujin" ("Jewel Lords"), the figures were displayed as coming from some blue "crystal planet", that is visible on the japanese boxes. The blue package design was also used (but in a different way) for the european Jewel Lords boxes. On the right you can see a picture of all three Jewel Lords, coming from the catalogue that was put in the box together with the figures. 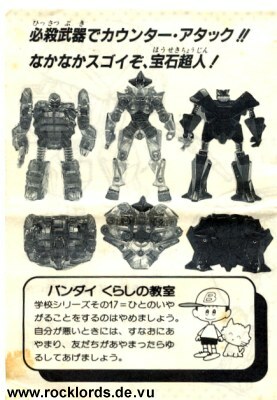 An other Picture of the Jewel Lords from a japanese catalogue. Solitaire just looks awesome here, all in blue she fits perfectly with the other two. But because it had to be a Diamond, Bandai obviously decided to add more clear parts to the "Diaman" figure.